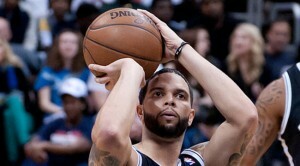 Deron Williams was taken by Andrew Feingold of RotoExperts with the 6th overall pick of the draft. This league is the oldest of the Triple Crown basketball leagues, established in 2004. It uses a head-to-head points system and a snake draft. One key to this league is looking at the UBC playoff weeks in an NBA games-per-week schedule grid. When looking at players of seemingly equal value, stock up on players with more games played when it counts. For example, this year, the Knicks have the best UBC playoff schedule, so Carmelo Anthony was a target of mine. I usually try to win this league with “boring” picks early that should score the most UBC points at that point in the draft, again with an eye towards the playoff schedule. I usually do well but fall short of a league championship. I do look at position depth and determined that it was important to get forwards early, keep an eye on the center position before it ran dry, and leave guards for later. I went against the grain of safety by taking Andrew Bynum with my first pick (8th overall). I figured when he returned to the court, he could score like a Top 5 pick, so I went for the upside. Then I went “safe” with ‘Melo in the second, Paul Pierce in the third, and Chris Bosh in the fourth. I then tried Ryan Anderson, figuring he could do in New Orleans what he did in Orlando the year before. I added Tyson Chandler, a solid center, in Round Six. I finally started looking at the guard position, and I took Lou Williams, Raymond Felton, and Mo Williams with my next three picks. I went for another center in Samuel Dalembert next, as rebounds and blocks pay off in the UBC scoring system. As the talent really started thinning out, I went for a couple more guards next with J.J. Redick and Mario Chalmers. I figured Chauncey Billups would provide decent numbers once he returned from his injury and got healthy, so he was my next pick. Shawn Marion can still be a “glue” player, so he was my next selection. I was able to draft yet another center, taking Emeka Okafor in Round 15. I filled out my bench with Tony Allen and Jonas Jerebko. I was very happy with my draft, basically accomplishing what I set out to do. Bynum and Billups can carry me to a championship if they can get healthy and stay healthy come January. Or they could ruin my season if the opposite occurs.